Old-fashioned Victorian gazing globes have made a comeback and we carry them in an assortment of colors and sizes. In addition, numerous gazing globe stands, in both metal and resin, are available. 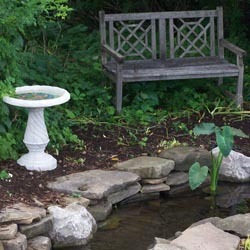 A wide assortment of bird baths are available in a variety of materials: concrete, cast aluminum and terra cotta. Place your bird bath in a location where you can kick back, relax and quietly observe the bathers. Set against a simple green background or placed on a garden pedestal amongst the flower, statues become a striking accent in the garden. Stop by and enjoy our wide variety of statuary with many different themes in durable resin and cast stone. Just the sight of our line of garden benches will tempt you to sit down and rest a spell. Choose from several styles of benches made of cast iron, eucalyptus wood, concrete and bamboo to add a sweet seat to your garden. 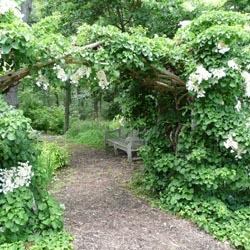 Traditionally, trellises and arbors have primarily been used for their functional purpose, support. Today, no garden is complete without one of these structures. They may be used for their designed intention or simply as an ornamental accent, pathway definition or focal point. We carry pvc, wood, powder-coated metal and forged iron trellises and arbors. 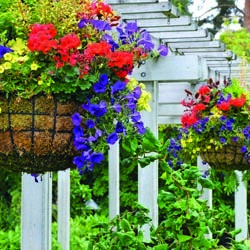 Hanging Baskets – Choose from willow, moss, metal, plastic and ceramic. Pots – We have pots from Italy, Malaysia, China and more. Choose from our selection of clay, plastic, cement, tin, zinc, lightweight insulated and self-watering pots. Planters– Choose from lined hayracks, cradle planters and cauldrons. We also carry plastic railing/fence/deck planters and plastic or glazed ceramic wall planters. Window Boxes – Available in cedar, pvc, plastic, metal and light weight insulated material with different sizes for different windows. The soothing and melodious sound of a wind chime is sure to enhance your outdoor experience. Indulge with wind chimes in aluminum, pewter or bamboo. Lanterns and torches are a gentle way to light areas for entertainment in the garden. Candles add a serene ambiance that is unmatched by any artificial light. Lanterns, torches and candles are captivating as their flame flickers in the evening breeze. Add a little whimsy to your garden with the addition of garden novelties. Choose from garden pixies, toadstools, Victorian water bells, wall plaques, glass bee catchers and much more. Stop by and see our great selection. No matter what your garden size, style or theme, we have the accents to give it a personal, fun touch all your own!